Standard plasterboard doesn’t get better than this – ideal for use on walls and ceilings in residential environments, Gyprock Plus features Optimised Core technology, making it stronger and lighter with significantly improved board handling. Gyprock Plus is typically used as a wall lining option in residential applications but can also be used on ceilings with standard 450mm joist centres. It is most suitable for areas of the home where exposure to moisture is not a concern such as bedrooms, living areas and entrance ways. 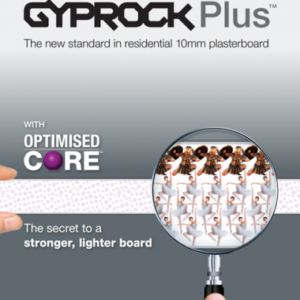 Gyprock Plus 10mm is part of the Residential Select Range of premium quality plasterboards. It is used for general internal wall linings and can also be used on ceilings with standard 450mm joist centres. 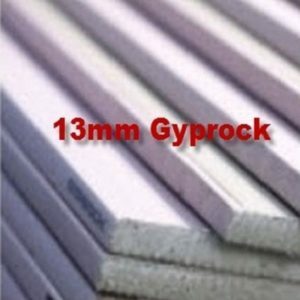 Information on Gyprock Standard Plasterboard 13mm for Commercial projects can be found here. Gyprock Plasterboard CD is part of Gyprock’s standard range of premium quality plasterboards. It is used for general internal wall and ceiling linings in residential and commercial projects where no specific fire, acoustic or moisture resistant requirements are specified. Gyprock Plasterboard CD is not suitable where it would be in contact with water or a constant relative humidity above 90%.